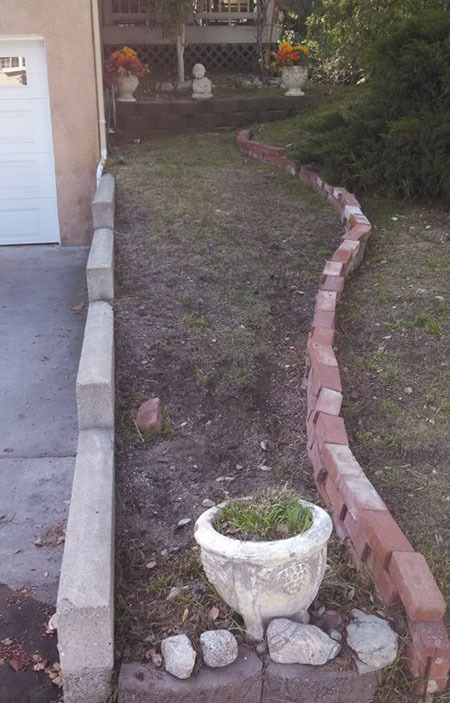 One of our customers had a narrow area in her front yard that she wanted to turn into a stream bed. No pond, just a stream bed. She liked the idea of providing an area for all the woodland critters that wandered into her yard a place to enjoy a drink of water but still be safe for the neighborhood kids. After all it is in her front yard. First, we planned together and marked out the area. This is the best way to see in real life the size and shape. 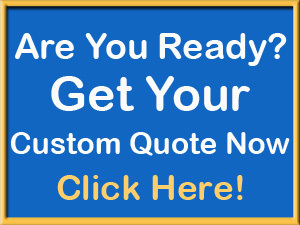 Many times a customer has an idea and when they see it – well it may need to be bigger or smaller. Secondly, we dug out it all out including a deep area for the water storage. 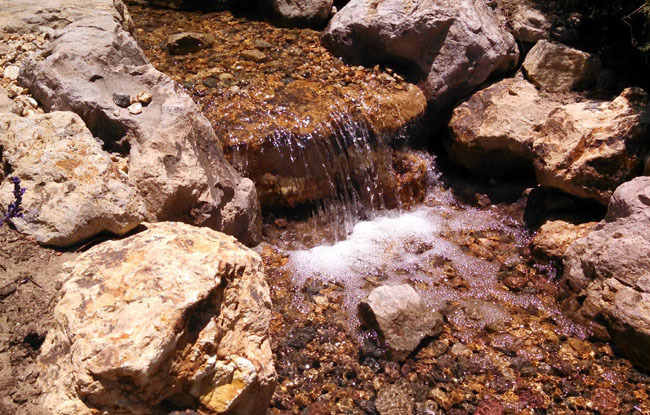 Remember even if you are making a pondless waterfall or stream bed there is a pond that holds all the water and the pump. It is just covered safely with rocks. But it is still there. 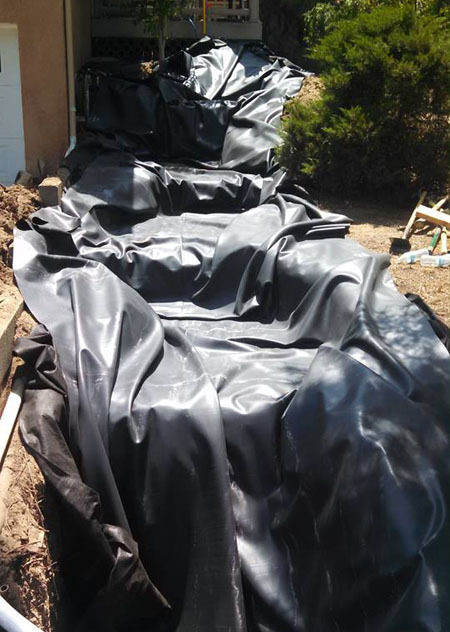 Thirdly, in goes the pond liner ( we like the firestone EPDM 45 mil pond liner) It is important to cover the entire pond and waterfall or stream area with one liner. This will minimize leakage. When you use a couple of smaller liners it is very easy to miss a fold or a rock can move and you will have a leak. 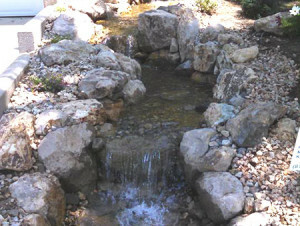 Then comes the fun – all the rocks are installed to make a gentle fall of water from top to bottom. At the end will be your pond area with your pump installed in the bottom. We use egg crate or plastic boxes to hold the rock up off of the pump. Fill the pit with rocks and you have the base of your stream bed. You can add pond plants like cattails or pickeral rush to name a few bog plants that will give your stream bed a more natural look. This couple was very happy to see the deer and other friends coming on a regular basis to enjoy the cool water. 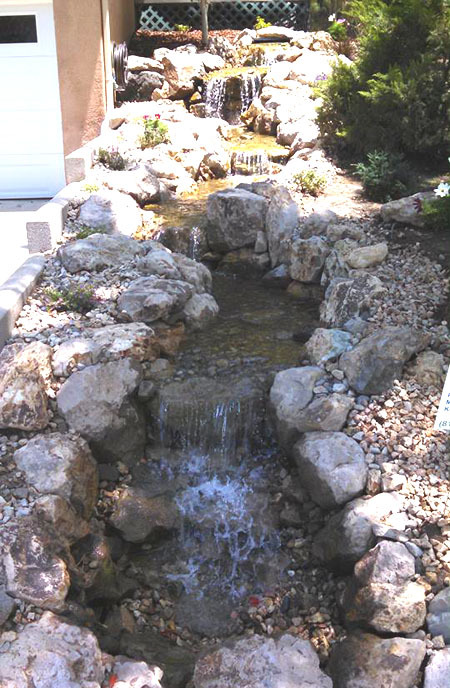 They also enjoy the beautiful water feature and wonderful sound of water flowing in their front yard.